Brian’s singular goal is to make every client a client for life. 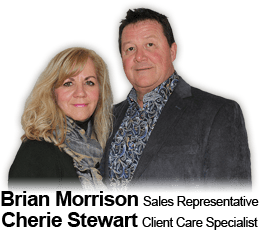 As a dedicated full time Realtor since 1993, Brian is well known for his integrity, professionalism and extensive knowledge of the local Kingston and area market. These traits combined with his knowledge in residential, new home construction, general contracting, land development, home inspection and environmental consulting, ensure that you, the client will be well represented. Brian acts as an advocate for his clients and takes the trust they place in him very seriously. As a result of his high quality of service Brian maintains a strong client and referral base. For prompt professional service you can contact Brian direct at 613-539-1114 or email bmorrison1004@gmail.com. I am the daughter of a military family and Korean War Veteran. Over the years and several moves, I have the understanding and knowledge to facilitate the process of relocating. After my fathers many years of dedicated service, our family was fortunate to call Kingston our home at his retirement. I was employed at the Kingston Whig Standard and after 37 years retired as the Regional Business Manager. I now use the skills and expertise I acquired to assist my husband Brian, to provide the best possible service to his customers and clients. For prompt professional service call me direct at 613-539-1114 or email bmorrison1004@gmail.com.